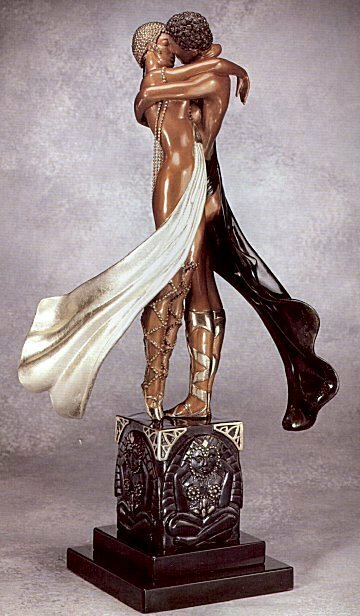 Original Limited Edition Bronze, 1990. Edition Size: 375 Arabic Numerals, 50 Roman Numerals, plus proofs. Bronze Size: 20" x 10" x 7.5." Incised with the artist's signature and edition number. Published by Chalk & Vermilion Fine Arts. Mint Condition. Certificate of Authenticity included. Suggested Retail Gallery Price: $28,000. Click the button below to add the Exciting Lovers & Idol (Bronze), Ltd Ed, Erte - Mint! to your wish list.